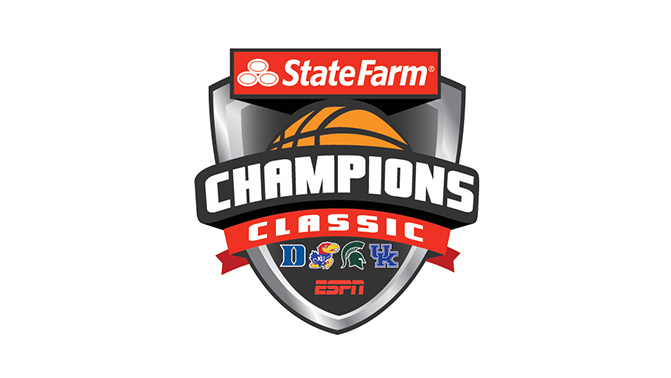 The Champions Classic is no doubt one of the best early season college basketball events. The annual double header features Kentucky, Duke, Michigan State, and Kansas. This classic began in 2011 and rotates cities and match ups each year. This year’s classic helps tip off the 2018 college basketball season on Tuesday from Indiana for the first time since 2014. This year’s matchup’s pit #10 Michigan State vs #1 Kansas and #2 Kentucky vs #4 Duke. All four teams are presently ranked in the top 10. In this year’s games, Michigan State is 2-0 against Kansas, while Kentucky and Duke have split each matchup. As Kansas enters the season as the #1 ranked team, it’s worth noting that #1 has played in this classic 4 out of 7 years and is 2-2 overall. Let’s take a look back at the previous two games between these teams. Wildcats lost in the Sweet 16 to Kansas State. Shai Gilgeous-Alexander, Kevin Knox, Hamidou Diallo, amongst others are gone. They will be replaced by another batch of five-star recruits. But most importantly, Kentucky brings back some of it’s 2017 freshman class including – PJ Washington, Nick Richards, and Quade Green, plus add Stanford transfer Reid Travis. Blue Devils have a super team, comprised of the top 3 freshman out of high school – RJ Barrett, Cameron Reddish, Zion Williamson and another top 20 recruit, in Tre Jones. That should make up for the losses of Grayson Allen, Marvin Bagley, and Wendell Carter. Marques Bolden is their main returnee. Seth Curry led the way for Duke with 23 points. Mason Plumee scored 18 points and Ryan Kelly and Rasheed Sulaimon each had 10 points. Alex Poythress led Kentucky in scoring with 20 and Archie Goodwin and Nerlens Noel each had 16 points. Brandon Ingram played just 19 minutes for Duke as he spent much of the game in foul trouble. Marshall Plumlee had 12 points, 10 rebounds and Matt Jones and Amile Jefferson each led the way with 16 points. Grayson Allen also ensured foul trouble and scored just 4 points on 2-11 shooting. Three players scored double digits for the Spartans (only one has had much of an NBA career) – Keith Appling led the way with 19 points, Nuggets guard Gary Harris scored 18, and Branden Dawson had 12. Adreian Payne led the team with 8 rebounds. Elijah Johnson (16) and Ben McLemore (14) were the two leading scorers for the Jayhawks. Perry Ellis, a 7th year sophomore, scored just 4 points. Denzel Valentine was amazing in this game with a triple double – he led the way with 29 points in 38 minutes and also had 12 rebounds and 12 assists for the Spartans. Other notables include Deyonta Davis 4 points, 6 rebounds. 10 points, 9 rebounds for Matt Costello and 13 points for Bryn Forbes. Kansas was led in scoring by 11th year junior Perry Ellis, who scored 21 in the loss. Frank Mason had 14 points, Wayne Selden had 12 points. Who do you think wins each game on Tuesday night? Comment below. And for more college basketball talk, be sure to follow me on twitter @msschneid and instagram @mikedropsports.